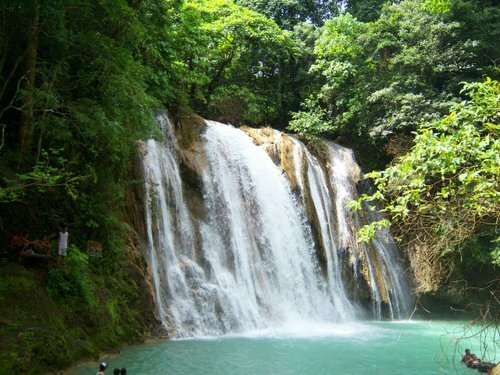 Daranak falls is located in Brgy. Sampaloc, Tanay, Rizal, a few minutes from Tanay market. It is a government-owned park and part of the laguna watershed. ♦ If you are going by private vehicle, just follow the road going to Laguna from Antipolo. At the Daranak-Tanay junction, turn left and head straight uphill. You will see a sign “To Daranak Falls” at the left side of the road. You have to turn left here. It’s hard to miss since there are several fruit stands on both sides of the road which sell fruits in season. Once you have turned left, just go straight, passing by several farms (poultry and hog) which you will notice by the smell =). Check you brakes as you will pass by rocky steep roads. You will arrive at the parking area of Daranak at the end of this road. You have to pay for parking, entrance fee (about P20/person) and cottages (about P350 for a small one). Overnight stay is not accommodated. ♦ If you are going by public transportation, you can ride a jeep or FX to Tanay in Araneta center (Cubao) or in front of StarMall (Edsa cor shaw blvd). Get off at Tanay market and take a tricycle (or jeep if you are a large group). You will normally get the tricycle for P150/trip (max 3 passengers). You can bargain for the return trip as there are no tricycle waiting near the falls. You will have to take a hike to the main road to get a ride back to the market. Batlag falls is situated near the top of the falls. You will have to pay a separate entrance fee though. From EDSA Starmall: There are vans (GT-express) that are lined up near starmall. The fare is around 70 pesos. Travel time going to Tanay is around 2.5 hrs. Hi thanks po for sharing this post, this helps alot. We’re planning to go there by the end of August with some foreigner friends, ok pa po kaya pumunta jan? Wala pa po kasi nakakapunta for first hand experience … and i heard lots of comments / sabi-sabi na hindi na raw maganda pumunta because its polluted / over populated already. Ok pa rin po kaya sya na tourist spot? Diko pa kasi naupdate yung blog ko. Too bad! Im sure may next time pa.